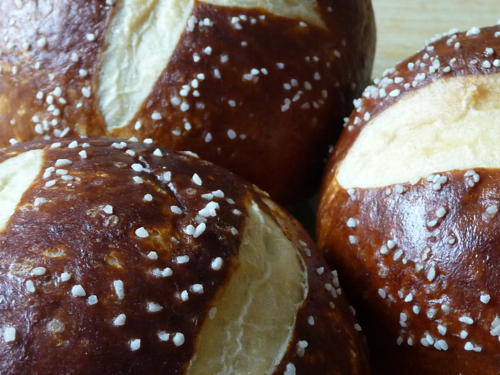 Confectiona’s Realm » Blog Archive » Pretzel Bread? I have a friend who once had this thing she called pretzel bread. She wanted me to make some. I had never heard of pretzel bread. But through the magic of the internet, I found some at Two Bites in Suburbia. And it was good. I made four loaves for eight people the other day, and they went fast. We couldn’t decide whether it was best to cut the loaves in slices or in wedges or just to rip them apart. We had to find out. It was science. For the record, wedges were the best. 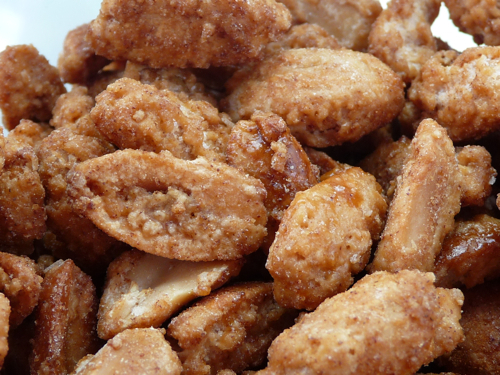 I also made some of David Lebovitz’s Killer App Candied Peanuts. They were incredible, although they do take a bit more time and effort than he indicates in the recipe. But totally worth it. I can make these only to take places, because I can eat the entire batch without even noticing. I know it’s bad form for me to always send you elsewhere for recipes. Soon I’ll start posting my own, I promise! This entry was posted Monday, August 11th, 2008 at 8:11 pm	and is filed under baking, bread. You can leave a response, or trackback from your own site. Glad you enjoyed the bread! Knives never make it close enough to the loaves when I make them. They’re just torn apart like the hungry bread animals we are.